Home / News / 3 bikes! 3 fuels! Which will be the first fuel alternative? 3 bikes! 3 fuels! Which will be the first fuel alternative? Motorbikesindia.com have taken an in depth look at the future for India’s two-wheeler market, and we have been stunned by the ingenuity of individual Indian inventors and manufacturers who have come up with some remarkable new concepts running on alternative fuels. First and foremost is a group of Indian engineering students in Haryana who have invented a pollution free bike that runs on AIR! Resulting in no carbon emissions, which is one of the current key concerns for the Indian government. However, before we all get too excited about eliminating the need for petrol! There is still a long way to go before the concept becomes a reality, and can potentially be a mass-produced product (or not). There are a number of obstacles to overcome before India’s love affair with motorbikes even begins to shift from petrol combustion to fresh air. Looks: As you will see from the attached “YouTube” video, it’s not exactly a “Babe” Magnet! Carrying two very large air compressors at the rear of the bike. Like all new ideas there has to be a starting point, so hats off to the guys for getting this far. As somebody once said “it is the dreamers of the day that change the world”. If you thought the concept of “AIR” as a power supply for a motorbike was an incredible and impossible dream? Well how about H2O! Another impossible dream you would think? Well, actually NO, a 20-year old, namely Bhaumik Patel from Vadodara has done just that! By using water to power his Bajaj Pulsar motorbike! Patel has not had the type of education you would have naturally thought would lead to his invention, he did not attend the Indian Institute of Technology (IIT), or any other leading technical institute, he does however, hold a SSC and did attend a number of workshops on aeronautics. He was inspired by his basic understanding of separating hydrogen from water, and set up a small lab in his father’s shop in Nagarwada. His breakthrough came, when he designed a circuit that took power from the motorbikes battery, which then successfully started the process of separating hydrogen from water. The next step was to send the hydrogen to the fuel tank, which he successfully achieved, which then powered the bikes engine! Genius! He managed to run the bike for half an hour on just 600 ml of water! Patel has invested a large amount of money into the project and hopes to apply for the patent for his invention (water fuel) in Germany and Japan. One of his key concerns is that he has not applied to protect his idea in India, and worries that others may take his idea. The following video shows a motorbike in the Philipines powered by water. Motorbikesindia.com salutes this young man´s ingenuity, and we wish him great success in the future. With the price of petrol in today’s commodity market we can all hope that Patel and companies such as Biosfuel in New Zealand and Aquygen in America, who are working on the same concept, succeed in their quest to reinvent how motorbikes and other forms of transport are powered. Although not strictly a new concept, diesel powered bikes are starting to make noises (in more ways than one) in India’s massive two wheeler market. Motorbikesindia.com have learnt that currently bikes like the Hero Honda Diesel 400, which is soon to be available on the Indian market, has been creating great excitement and expectations. A previous entry to the Indian market was the Royal Enfield Taurus, until new pollution laws a few years ago banned the use of particular diesel bikes in India. Royal Enfield in India was the only manufacturer until recently, which has built a diesel motorcycle in mass production. A 6.5 hp industrial diesel was installed in the frame of the British-based Royal Enfield. However, due to pollution laws, this bike is no longer in production. It was however at that time of production one of the most fuel-efficient bikes in India returning over 200 mpg! Initially street mechanics were mounting this engine in used Bullets, like retro Royal Enfield Bikes, with the 350 cc retrofit engine developing 18 hp. On seeing the success of these bikes; Royal Enfield started manufacturing Bullets with the diesel engine and named it the Taurus. The Taurus was available with an Electric Starter. A Saharanpur based company, Sooraj Automobiles produce diesel motorcycles with Royal Enfield gearbox fitted with Lombardini 334cc diesel engine, Company advertised fuel efficiency of 80kmpl, and most of them are still in running condition. With competition getting intense, India’s oldest motorcycle manufacturing company, Royal Enfield, is exploring newer segments, with the idea of bigger engines and diesel variants with lower emissions. Enfield is planning to bring diesel-powered bikes back into the Indian market, a project for which work is ongoing. So back to the Hero Honda Diesel 400 (seen below), which will bring diesel bikes back to India on a mass-produced basis in 2013. On first impressions it looks like a winner, we particularly like the lines and the colored wheels, and we look forward to the opportunity of test-driving this bike. 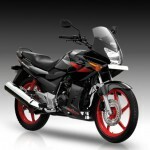 Hero Honda is now introducing an innovative motorcycle, the Hero Honda Diesel 400, which will be launched soon in India. Due to the hike in petrol prices in India, now Hero MotoCorp has come up with its first new Diesel Bike. It will be packed with cutting edge technology and many safety features. So Air, Water and Diesel alongside the traditional petrol powered bikes; we cannot wait to see the petrol stations which they may have to rename “all fuel stations” in the future with all their different offerings! And, we have not even touched on the “Electric” option. It will be very interesting. In summary, motorbikesindia.com is very excited about the progression of the motorbike industry in India. We will be reporting on up to date developments as and when they occur. The ability of the Indian market to innovate and change has never ceased to amaze the team here at MI, and we look forward to further changes that will enhance the experience of the Indian “biker” although we are not sure on what “Fuel” the next innovation will bring. Perhaps we will see bikes running on seaweed or milk! Who knows?